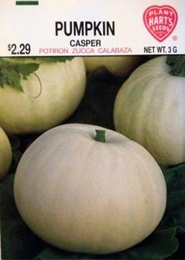 Unique white pumpkin produces good yields of 9 - 12" pumpkins weighing 10-16 lbs. Smooth skin allows kids to draw or paint for Halloween. Thick flesh is excellent for baking or pies. Protect from insects and water as needed. Allow the fruits to ripen on the vine until fully matured. Gather before frost, cut stem with pruning shears leaving 3 inches attached to the fruit.